The Evolution WordPress Framework has been designed as a fast and secure foundation for developing WordPress themes. The modern architecture is based on WordPress Action Hooks and allows you completely free design with complete update security. The modern and future-proof architecture gives you completely free rein to hook your own functions into the existing hooks. If you want to rework a theme on every page of your website, you need to throw a bunch of templates from your parent theme folder into the child theme folder. All I need are two files. The functions.php and the style.css of the child theme. These two files allow me to rework an entire theme. And it’s not even difficult; you can do it too. However, the most important thing is the safety of a theme update. When developing a child theme from a parent theme, two versions of a function are used. One is the function in the parent theme, and the other one being the overwritten version of the child theme. In many cases, this doesn’t end well. I’ve experienced that before. Evolution is an entirely different thing. You don’t need to change template files, as you merely need to save a new function in the Action Hook. The template file comments.php leads you to the right folder and the file with the functions used in the comments.php. The critical hook can also be found in the file. By the way, the 40 refers to the so-called priority. It controls the display of the function. The lower the number, the earlier the function is displayed in the template. Now, if you want to rebuild the comment form, the first thing you do is delete the original function. Load, unlock and kill the function. Forever. As the function does not exist anymore, there can be no issues with an update. If it’s not there, it can’t cause problems. Now, write your new function with the WordPress Coding Standards in mind. Don’t use outdated WordPress tags, and make sure the function is »pluggable«. Pluggable functions use a small query before executing the function. Translation: If the function does not exist yet, execute it. This is a needed amount of protection from duplicate function names. Now, your new comment form is displayed, and updates of the parent theme won’t cause any issues, as your function is the only one left. This way, you can quickly switch any function, and any content markup, without having to fear running into problems. And above all else: without touching a single template file. All you need to do is keep the right priorities in mind, to make sure that the display is correct. If you want to add extra functions to the individual templates – like the single.php for example – that is quite easy to do as well. Get a short overview of the priorities, then create your function. The priorities 5, 10, and 30 are taken. In this example, you can add it before the loop with the priority 8. This way, it is displayed after the opening markup, and before the actual loop. If you want to show it after the loop, assign a priority between 11 and 29. After that, you may add a function or a loop with the priority 10, and so forth… In the end, you need to add the closing markup. 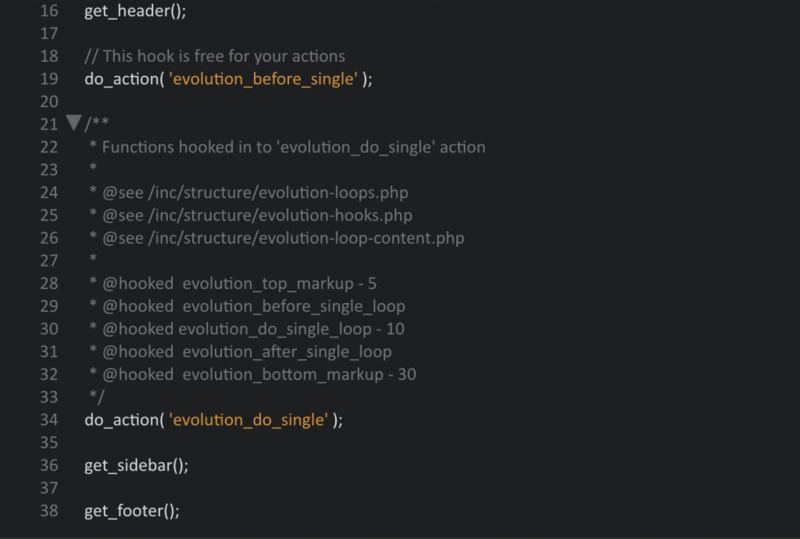 The taken hooks can be found here: /inc/structure/evolution-hooks.php. This way, you could exchange the parent theme’s entire content without any update problems. The existing websites would merely be displayed differently. Cool, right? Evolution was developed for maximum speed, as neither Google nor your visitors like slow websites. 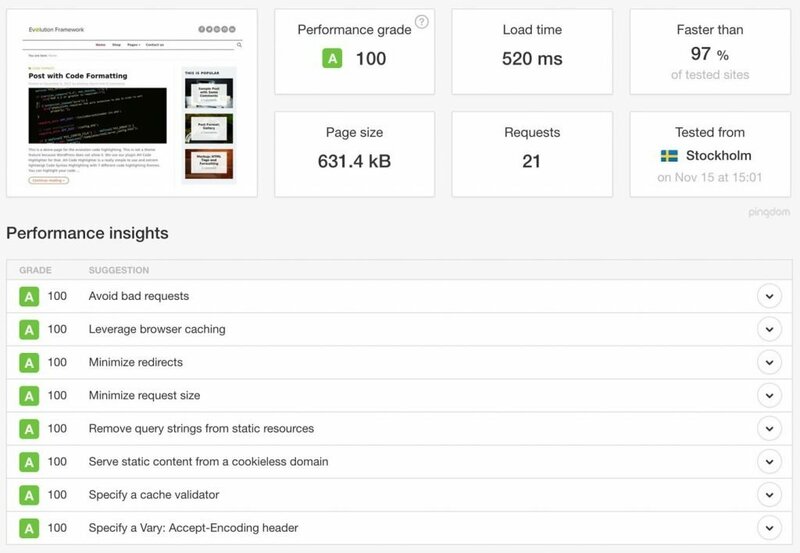 An optimization for real fast loading times begins with the code of the theme. This is also the bottleneck of many multi-purpose themes. Due to the plethora of functions, most of which are not even used, the source code is bloated, and dozens of style and script files have to be loaded. All of that slows down a website. Evolution is reduced to the essentials. If you want more, install according plugins. In the case of a theme change, this is an advantage as well, as all functionalities you’re fond of remain. The second run was measured. What is a theme framework without a support of the popular e-commerce plugin WooCommerce? By the way, WooCommerce also works with Action Hooks. Thus, there is no reason to copy the plugin’s templates into the child theme to rewrite them. And this is the root of many issues with WooCommerce. You can quickly delete existing plugin functions and replace them with your own. At the same time, you’ll see the function that is hooked into the hook. This is the foundation for the next works. Now, register a sidebar for widgets, and name it »WooCommerce Sidebar«. Assign the ID »woocommerce«. Now, hook your new sidebar into the woocommere_sidebar hook. Now you’ve got a new sidebar on all WooCommerce pages, without having to touch a single template file. This works for all WooCommerce functions. Take a look at the templates (woocommerce/templates/), search for the Action Hook, and just exchange the functions. By the way: the pages cart and checkout are no WooCommerce pages, but regular WP pages. This means, that the normal blog sidebar is displayed on them. You can either change that using the nosidebar.php template, or the plugin AH Display Widgets. The plugin lets you influence the display of certain widgets on specific pages.